On Jan. 16, Acting EPA Administrator Andrew Wheeler confirmed that the agency currently plans to complete a rule allowing year-round E15 by June 1, but cautioned it will be unable to meet that deadline if the government shutdown continues. Attis Industries Inc. has announced plans to purchase a New York-based ethanol plant. The company also recently announced a collaboration with Novozymes to provide biotechnology for ethanol production at its biorefineries. Aemetis Inc. has announced that the California Alternative Energy and Advanced Transportation Financing Authority awarded its Riverbank Advanced Biofuels Project an exclusion from the payment of California sales and use taxes valued at $12.7 million. Iowa Gov. Kim Reynolds has requested state funding to support the Iowa Renewable Fuels Infrastructure Program, which provides cost-share grants to help fuel retailers in Iowa install equipment needed to offer higher blends of biofuel. The U.S. Energy Information Administration has released the January edition of its Short-Term Energy Outlook, maintaining its December forecast for 2019 ethanol production levels and offering its first short-term forecast for 2020 production. 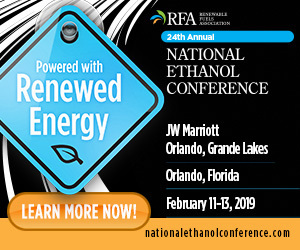 With less than five months before the start of the summer driving season, the RFA has launched an awareness campaign to educate consumers and policymakers about the benefits of E15 in anticipation of the blend being available year-round. ICM Inc. has announced an agreement with Usimat Destilaria de Alcool Ltda (Usimat) to implement ICM’s proprietary technologies at Usimat’s ethanol plant located in Campo de Julio, Mato Grasso, in Brazil. New information about global market development efforts for U.S. ethanol and the benefits of the biofuel to global customers is now available online at www.grains.org, according to the U.S. Grains Council. With the government shutdown threatening to further delay approval of year-round sales of E15, the RFA is urging the U.S. EPA to focus strictly on year-round E15 provisions in its forthcoming proposed rule and address RIN reform measures separately. 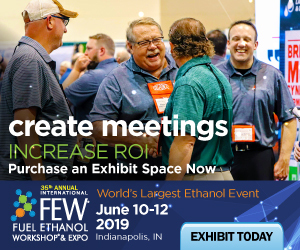 The U.S. Grains Council utilized Market Access Program funds to promote U.S. corn-based ethanol in the Japanese market with the potential of up to 1.3 billion gallons of U.S. ethanol use if an E10 blending level is achieved.